A used Mercury Capri Door Shell / Capri Door Shell: RH / passenger's side or LH / Driver's Side - "BARE" - USED; A "BARE" Mercury Capri Door Shell / Capri Door Shell means, in our case, that it does not include: Window Regulator, Interior & Exterior Panel & Trim, Mirror, Glass & Rub Strips/Molding for all 1991, 1992, 1993 & 1994 Mercury Capri Models. You can add a complete door with glass Window regulator by using the drop down menue provided. If you decide to add the Window Regulator and, or, the Glass, the applicable surcharge the additional these items will be displayed and automatically added to your order. Due to the size of this original Mercury Capri Door Shell / Mercury Capri Door Shell / Capri Door Shell, the only shipping options available for these Mercury Capri Door Shells are Truck Ground Freight with the freight charges varying based on if other body parts are being shipped at the same time. The shipping "Upcharge" of $250.00 displayed when checking out is the average Ground Truck Freight Charge (Including Labor to pack on pallet). This cost of course can be higher if multiple items are shipped. We will contact you if this charge is higher than $250.00. Finally, you can request a specific color when placing order (order notes), but we can not guarantee meeting request. However, these Mercury Capri Doors / Capri Doors can be repainted to match the rest of your Capri. Kindly use the "Drop-Down" menu provided below to select if you want a RH / Passernger Side Door or Left / Driver's Side Door. These Mercury Capri Front Door Shells / Mercury Capri Door Shell / Capri Door Shells are priced at about 50% BELOW Ford's last new list price of ~ $900.00 each. For ease of identification, the original Ford part number for this Mercury Capri Front RH / passenger's side Door Shell was: E9JY-620124-A / E9JY7620124A and E9JY-7620125A / E9JY-7620125A for the Left. *PLEASE NOTE: These Mercury Capri front Door Shells / Mercury Capri Door Shell / Capri Door Shells are close to 25 years old, and as expected with any used body part, they are not in no way "perfect", and therefore typically need some cosmetic repair; they typically have some surface defects (scratches, peeling paint, prior repairs, some small "parking lot" dings/dents, etc.) which can typically be easily repaired by professional body shop. Therefore as per our stated policies, all "Sales Are Final" and "As Is" on these used Mercury Capri Front Door Shells, as well as all other used parts we sell. Therefore as All "Sales Are Final" / "As Is", there are no warrantees, guarantees, returns, exchanges, and/or refunds whatsoever on these used Mercury Capri Door Shells / Mercury Capri Door Shell / Capri Door Shells. Kindly note that any order for body parts is non-cancellable once placed, so please place your after knowingly accepting this policy and only after reading the item description and store policies. 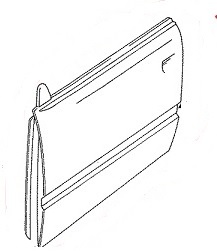 Application - All Mercury Capri models including the XR2 / Turbo - Mercury Capri Door Shell / Mercury Capri Door Shell / Capri Door Shell: 1991 / 91 Mercury Capri Door Shell / Mercury Capri Door Shell / Capri Door Shell, 1992 / 92 Mercury Capri Door Shell / Capri Door Shell, 1993 / 93 Mercury Capri Door Shell / Capri Door Shell, 1994 / 94 Mercury Capri Door Shell / Capri Door Shell.